Dr. Gabriella Nocerino was born and raised in NYC. She completed her undergraduate studies at Georgetown University, where she graduated with a Bachelors of Science in Biology. She returned to NYC and obtained her Doctorate of Dental Surgery from New York University in 2015. 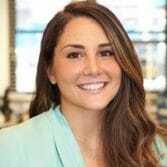 Upon finishing dental school, Dr. Nocerino completed a General Practice residency at St. Barnabas Hospital in the Bronx, where she was awarded resident of the year and later selected to serve as Chief Dental Resident. Dr. Nocerino excels in connecting with others and is highly regarded for her gentle approach. She believes that fostering a trusting doctor-patient relationship is essential in achieving treatment success. Dr. Nocerino strives to make your experience an enjoyable one.